What do you generally do with your old mobile phones? It seems that people now change their mobile phones every 18 months in the US. And, as far as I can observed, we do the same thing here in Mauritius. This implies that most of us must have 1-2 old mobile phones in a cupboard somewhere. In many countries, there are myriads of organisations which collect old mobile phones to give them to poor people. 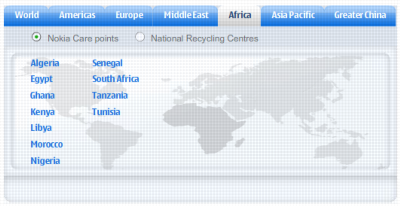 Does anyone know if there are similar organisations in Mauritius? As for the mobile phones which are broken (or really outdated), the solution in recycling. But, once more, living in Mauritius provides no joy: I’ve just noticed that we do not have any Nokia Care points in our island (unlike Algeria, Egypt, Ghana, Kenya, Libya, Morocco, Nigeria, Senegal, South Africa, Tanzania and Tunisia.) Hey, BAI people, instead of wasting time and money on buying cars that cannot be used on our roads, build a Nokia Care point. It’s better for the environment. It seems to me that a lot of people in Mauritius will invest in an LCD TV this Christmas (see my recommendations.) But it also seems to me that a lot of people have not really thought about High Definition content or, rather, the lack of it in our country. Standard television (we use PAL and/or SECAM here) displays 576 lines with an aspect ratio of 4:3. The horizontal resolution being around 720 implies that there are approximately 400,000 dots displayed on a normal TV (I’m simplifying.) This is exactly the number of dots what our local TV broadcaster, MBC, sends us through our antennas (this is true for both analog and digital TV (TNT).) 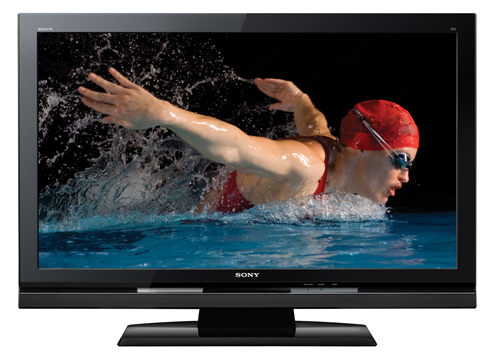 Interestingly, satellite decoders and DVD players also give us 400,000 as both have been designed with standard televisions in mind. Now, let us put an LCD TV into the equation. LCD TVs come in two families: Not Full HD (720p) and Full HD (1080p). The difference is the number of dots being displayed onscreen (the resolution.) A Not Full HD TV (which we tend to call HD Ready here in Mauritius even though, technically, a Full HD TV is also HD Ready) has a resolution of 1280 x 720. This is about 900,000 dots and is more than twice the number of dots found on our existing standard televisions. If we climb the ladder to Full HD, we get a resolution of 1920 x 1080, which is more than 2,000,000 dots on screen, which is five times more dots than an standard television. The point I’m making is that MBC, TNT, Satellite and DVDs only have 400,000 dots and displaying them on LCD TVs full screen requires the television to upscale the image. In simple words, upscaling means creating the missing dots. For example, playing a DVD on a 1080p LCD TV will require the TV to create the missing 2,000,000 – 400,000 = 1,600,000 dots for each image displayed. Another thing is the refresh rate. Televisions normally display 25 images per second (I’m simplifying.) This means that the above calculation of missing dots will need to be done at the same frequency. Now, think about it. Can you see how much processing power is needed to calculate the missing 1,600,000 dots 25 times a second from what is coming from the DVD player? Can you see how complex this calculation is? And do you understand why the price in LCD TV sets vary so much? Yes, it’s because of the quality and precision of the upscaler. For instance, Sony and Samsung LCD TVs both have a complete PC inside with a powerful processor and which runs the Linux operating system! Note that I’m talking of original DVDs here. The pirated Rs 25 ones have pathetic image quality most of the time. The reason is that originals are generally double layers DVDs and pirated ones single layer i.e. half of the original content is thrown away on pirated copies. Upscalers only work adequately with original DVDs. But for this to be true we need to have this elusive device that can send Full HD content to the LCD TV. Why elusive? Because, simply speaking, there is not such a thing here. Or, more precisely, the hardware is available but the content is not. Blu-Ray – The DVD was designed ten years ago for standard televisions and now has been superseded by Blu-Ray. A Blu-Ray disk has movies encoded at Full HD resolutions i.e. the full 2,000,000 dots 25 times a second. Connecting a Blu-Ray player to the LCD TV using a quality connection (HDMI) means that we can get superb quality images. The major problem in Mauritius is that Blu-Ray disks are not easily available! Shops do not generally sell them and the few I’ve seen are priced out of reach for most of us (like more than Rs 2,000 for one movie.) Blu-Ray disks cannot be copied yet and maybe, ceci explique cela. High Definition Satellite – Canal Satellite offers two channels (Canal+ and TF1) in HD quality in Mauritius (an update: Parabole Maurice has TF1 in HD and DSTV has announced HD channels too.) Or so they say. First of all, the signal is 720p/1080i and not 1080p. So it’s at most 900,000 dots and not the 2,000,000 dots needed on Full HD screens. Secondly, it seems to me that the image quality is poor compared to Blu-Ray. Maybe the reason is that we are only getting low bitrate signals (I not done any scientific tests myself.) Bitrate is a measure of the amount of information being sent per second, Blu-Ray is about 2.5 megabyte per second (5 mbps max!) In France, Canal+ has an average bitrate of 1 megabyte per second (see this) and I would not be surprised if we are getting half of that bitrate in Mauritius for keeping costs down. In other words, Canal+ HD and TF1 HD are not really HD. At least, not here in Mauritius. High definition game consoles – Both the Sony PlayStation 3 and the Microsoft Xbox 360 are HD. Games run in HD but are priced out of reach for most of us (more than Rs 2000 for a game.) The PlayStation 3 is a Blu-Ray player too. But once more, Blu-Ray disks are not readily available in Mauritius. A lot of people I know are considering to get an LCD TV. But buying a TV to use it suboptimally is not a great idea. The problem is that we do not have access to High Definition content in Mauritius. I have a PS3 and, based on glorious reviews in magazines and websites like Gamespot and IGN, I bought Grand Theft Auto IV from Amazon in the UK a few months ago. It’s the PAL version obviously and is in pristine condition. 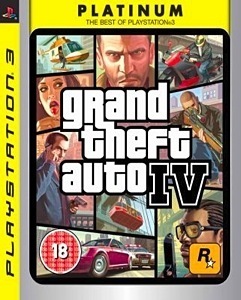 I’m selling the PAL version of Grand Theft Auto IV for the Playstation 3 at Rs 1000. 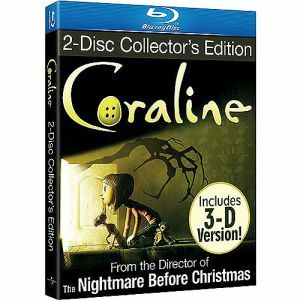 I am also selling Coraline, a 2009 movie which earned 7.8 on IMDB. I bought the Blu-Ray from Amazon in the USA but I was too stupid to realise that it was a Region 1 Blu-Ray which means it does not play on my Region 2 (PAL) Playstation 3. Naturally it will play in any Region 1 Playstation 3 as well as standalone Blu-Ray players if they are compatible with Region 1. It will also play in Blu-Ray players found on computers, once more if they are compatible with Region 1. Coraline is a “wonderfully imaginative animation — a visual masterpiece” (as seen on IMDB) and I have the 3D version which comes with four pairs of 3D glasses. In fact, those are the reasons I bought Coraline in the first place. I am selling the Region 1 Blu-Ray of Coraline at Rs 600. If you are interested in any of them, just send me an email at avinash AT noulakaz DOT net or give me a ring on 493-9394.